For KS1&2: A unique opportunity to learn about Bees in a half day or full day session combining science and literacy. Suitable for classes of up to 30 children. Available: Tuesdays & Wednesdays in April, May, June and July. Bees inspire curiosity. Children and adults are always bursting with questions about them. How do bees make honey? What happens if they sting you? What do bees eat? What is the queen bee thinking? What's it like to have 40,000 sisters? We love questions and use all of our senses to find the answers. Through direct observation, engaging practical activities and discussions children and adults become scientists, working it out as we go. 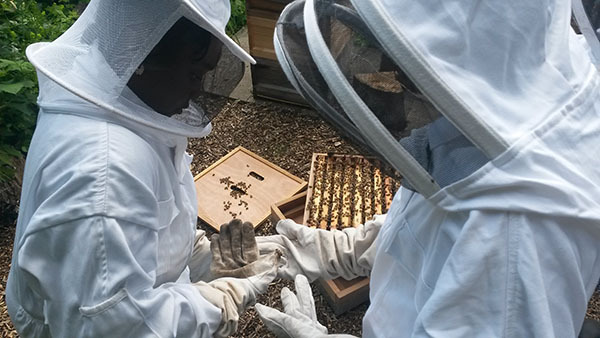 In this full day outdoor learning experience, we spend the morning donning our bee suits and visiting working hives, investigating beeswax through candle making and foraging for fantastic facts to share. In the afternoon we tackle powerful persuasive writing or performance poetry. Memorable experiences have a great impact on the quality of children’s writing and this stimulating day builds writing confidence. The results are always inspiring and surprising. Suitable for classes of up to 30 children. Available: Monday to Friday in April, May, June and July. Cost: £150 or £250 for two sessions on one day. A fantastic half day of exploration including an up-close look at our bee observation hive. Fact finding tasks and active games bring the science of bees to life in a beautiful garden setting that will engage all learners. A limited number SEN days are available for £50 when booking another full day session. For learners with SEN we have devised a highly sensory, full day workshop for a maximum of 8 pupils, giving them time and space to investigate and reflect and build confidence in collaborative learning.